Welcome to the forums. It appears to be a 1981 model but based on the colour I think it may be a Royale, which was a couple of models above the Custom Sport. What size (diameter) is the seat post? I haven’t any idea what the size is. I’m relatively new to cycling and this bike is now my rainy day commuter. The color is a dark sea foam green I’d describe it. Can’t post pictures yet since I don’t have enough posts on here. If you remove the size post and clean it off, you may find the size stamped on it. It could be anything between 25.4 to 27.2. This is the diameter in millimetres. I was able to see your pictures in your album. I thought it looked grey, which was used on the 1981 Royale. No such luck finding the stamped size. It does measure exactly one inch on the outside edge of tube. A 1" post is indicative of a hi-tensile steel. As such it should be a Custom Sport, as you originally suggested. 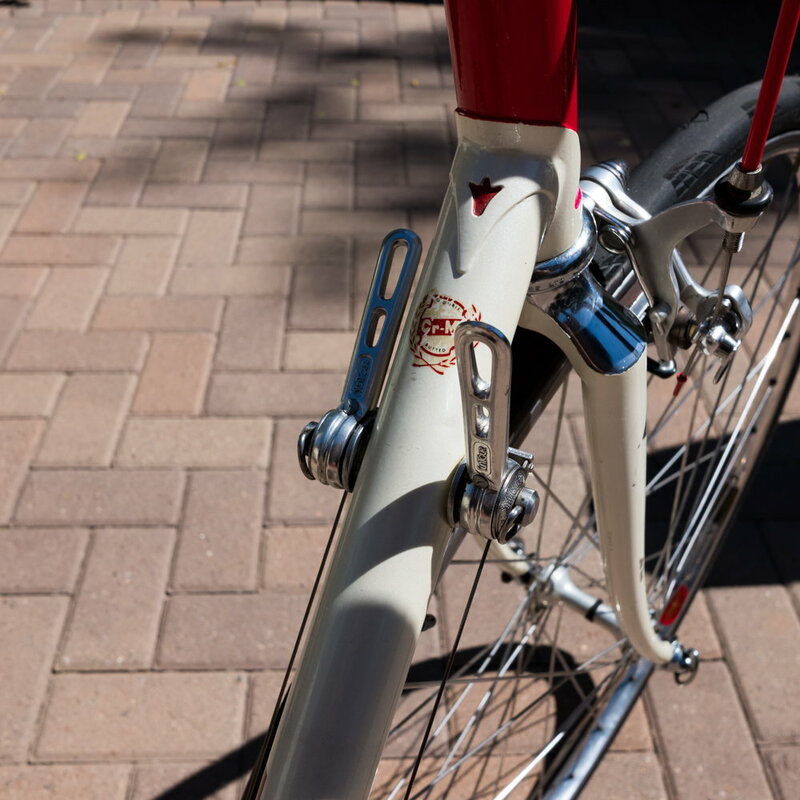 Circa 1981, the Custom Sport was the only hi-tensile model with chrome on the lower fork blades. Thanks for the help! 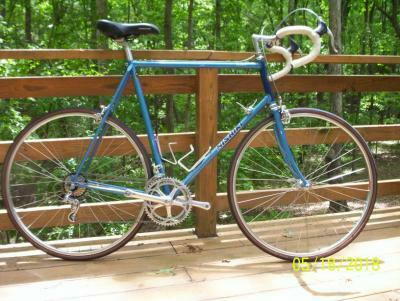 I’ve found the 1981 Nishiki Catalog online and don’t see this color as an option for the Custom Sport. Though it does look similar to the second color option for the Royale (bike not pictured, just a little swath) so it’s hard to say. I do see a sticker under the seat post that says high tensile tubing. That sticker confirms it is not a Royale., which used a CrMo tubing. 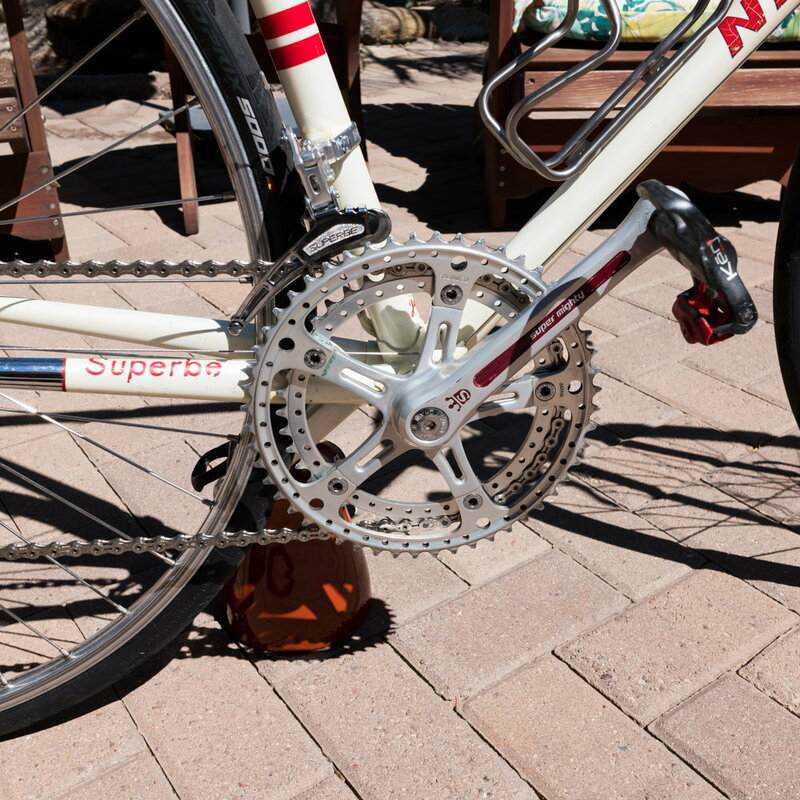 Of the hi-tensile models only the Custom Sport depicts chrome on the lower fork blades like yours. So, a Custom Sport is definitely the best candidate. Regarding the colour, specifications sometimes change after the catalogue is issued. Or it could be a non-USA model, as foreign models often exhibit variation from their USA counterparts. It could even be a simple painting error. Initially, I had thought the catalogue might be for the 1982 model year, as it indcates a 1981 copyright date and the new model year catalogues are typically issued late in the preceding calendar year. 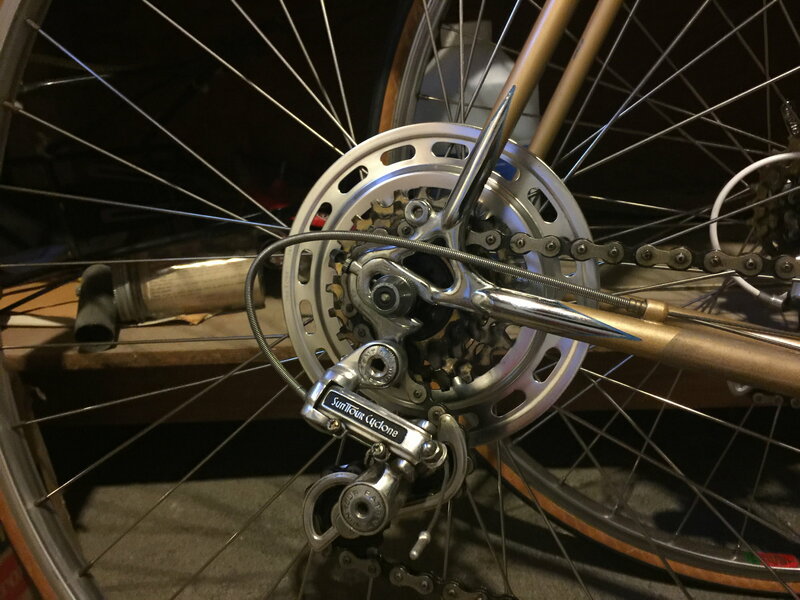 However, it doesn't mention any of the SunTour derailleurs that were new for the 1982 model year, so it does appear to be a 1981 catalog. Regardless, it a circa 1981, entry level model and almost certainly a Custom Sport. Enjoy your new acquisition. Frame: Champion #1 , Range Industries, Kawamura decal. I purchased this new in 1978,. Been in storage for years. Had my local shop in Phoenix (Landis) do a major tuneup. Rides like a dream! I’ve browsed this forum a few times but haven’t seen any serial numbers that fit the format of mine. Picked it up a few weeks ago from a bike store in Nashville. It’s been converted to single speed and has some other aftermarket parts. The model decal has been rubbed off but after some research my guess is that it’s a Custom Sport. It has the older eagle emblem on front tube. Trying to figure out how old this thing is. Any help is appreciated! 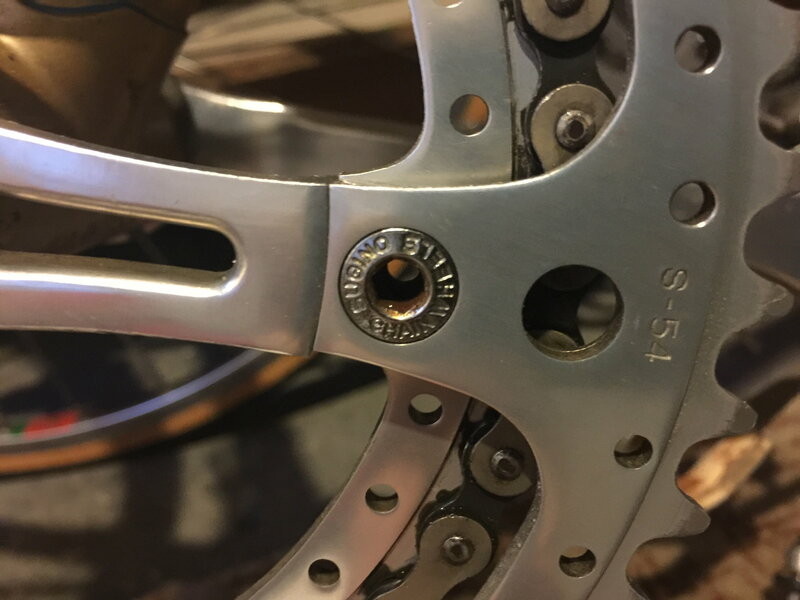 This serial number format is consistent with the Custom Sport or Olympic 12 models only. The Custom Sport was Toshiba High Tensile tubing. The Olympic 12 was Chrome molybdenum tubing. The Royale model had a different frame manufacturers serial number. Fresh and clean, very cool! 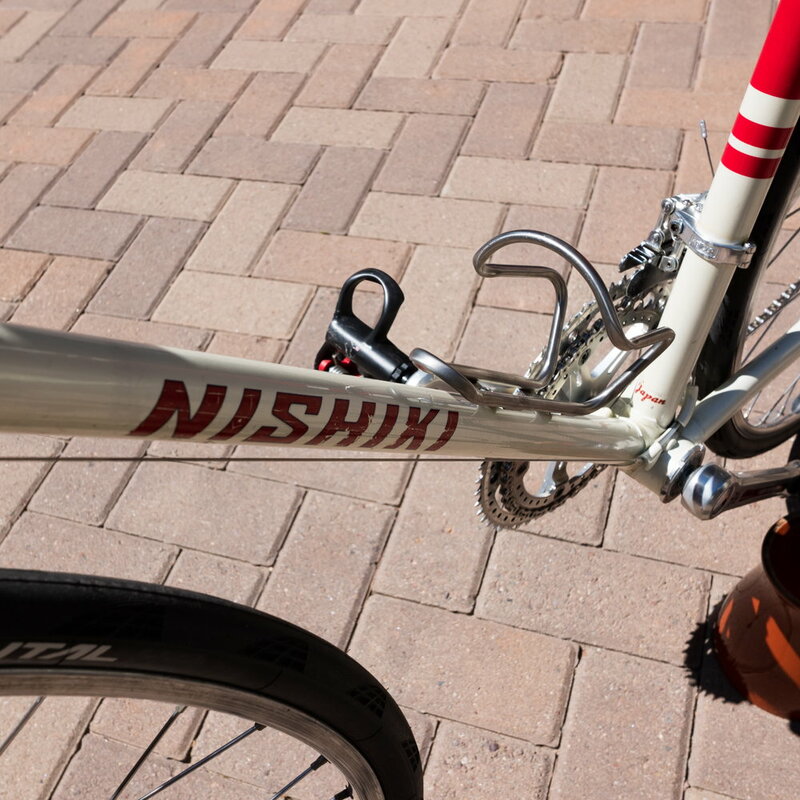 Nishiki Competition reporting for duty. 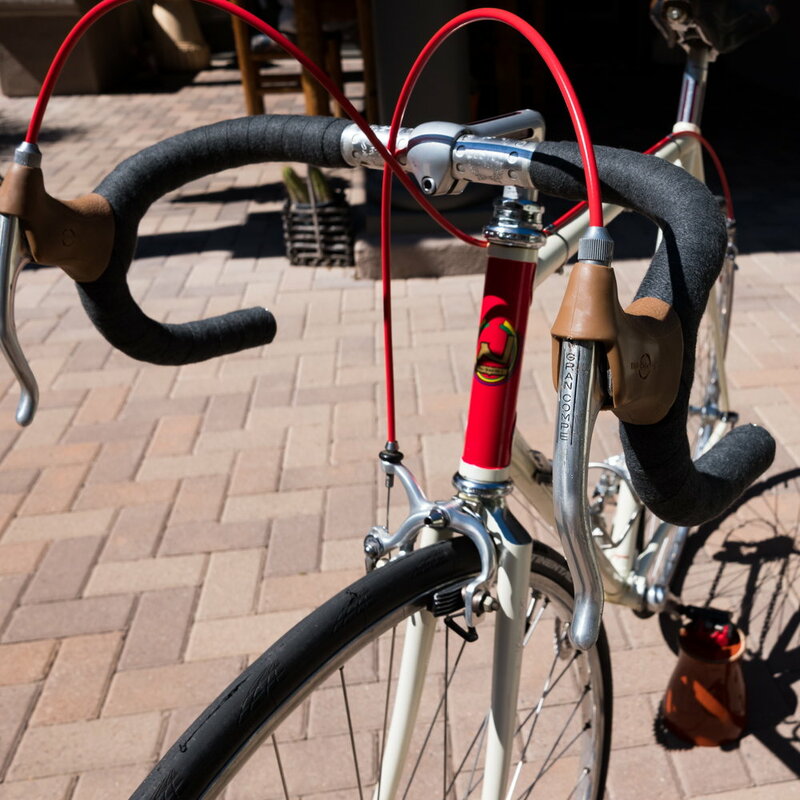 The "10 speed" on the top tube indicates an entry level model, as mid-range and higher models would have been 12 speed by the mid-1980s. 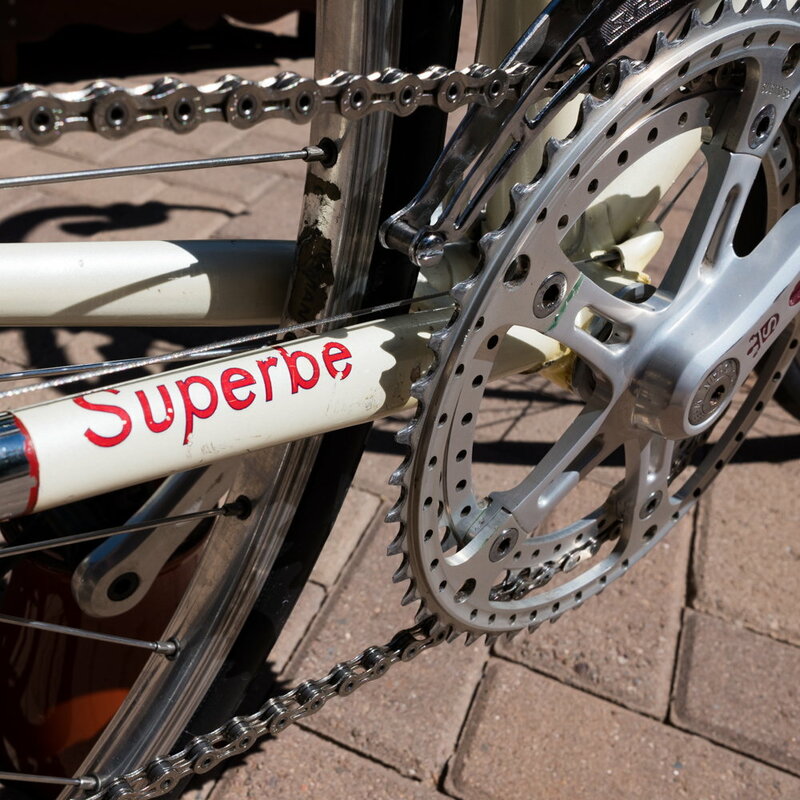 Entry level status is further substantiated by the Tange Hi-Tensile decal of the fork blades.There is a possibility that the main tubes may be a slightly higher grade. 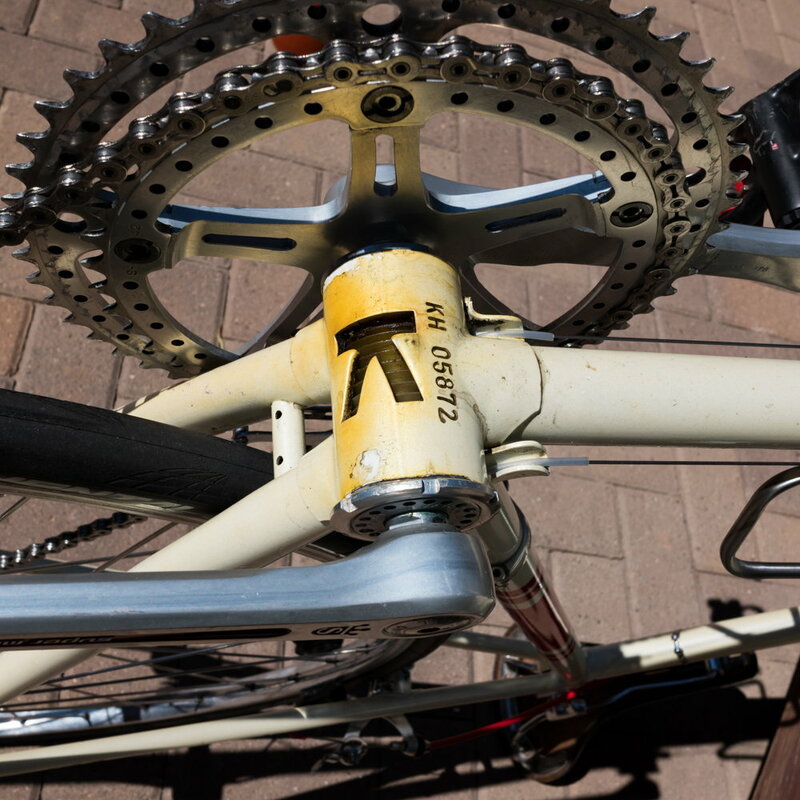 This is best established by determining what diameter of seat post properly fits the frame. 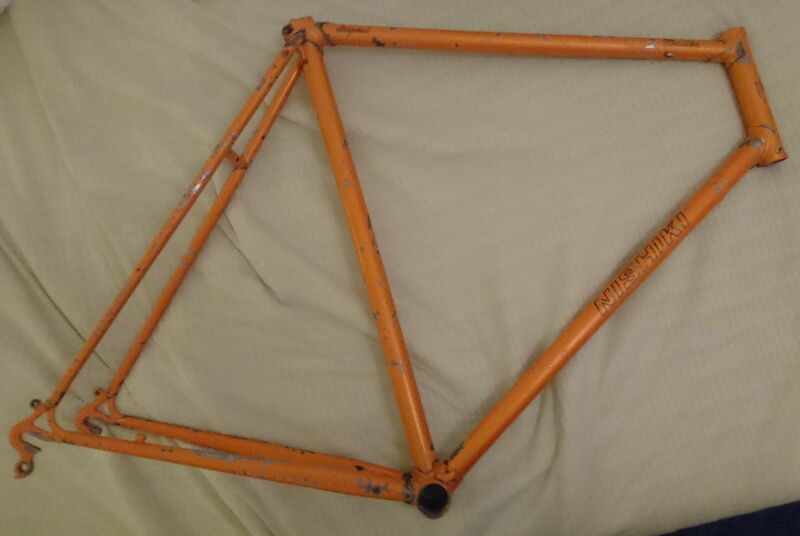 Based on the serial number, the frame was manufactured by Kawamura in 1977, for the USA market. While it could be a 1978 model manufactured in late 1977, I don't believe that to be the case. It is a good match for the 1978 model but for four exceptions. I'm assuming that two of those, the Avocet saddle and brake hoods, are aftermarket replacements. However, for 1978 the model name was abbreviated to "Comp". 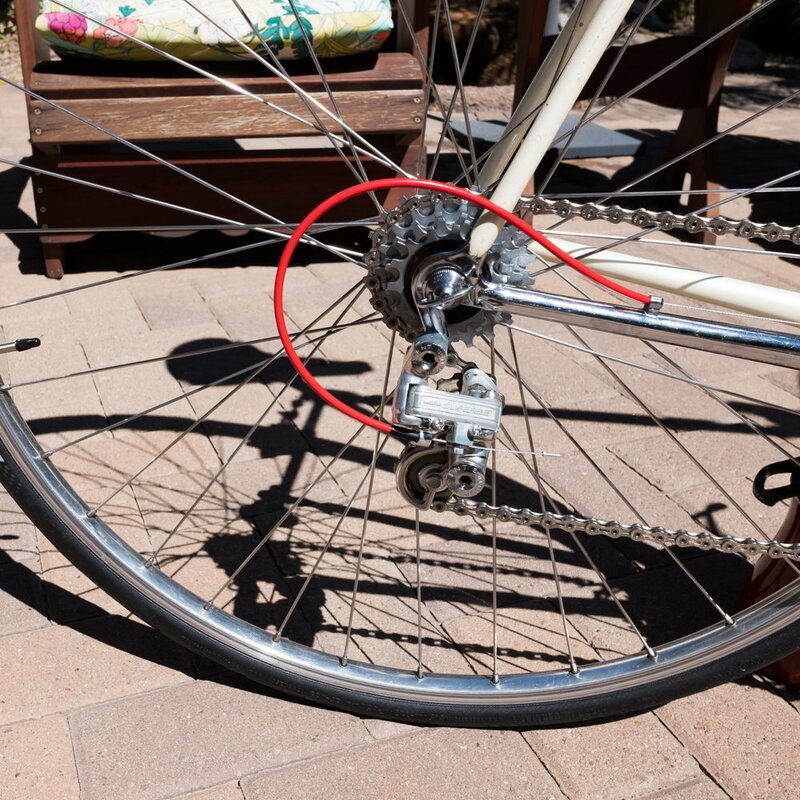 More importantly, the 1978 model was spec'd with a 700C wheelset, while the presence of Schraeder valves on the subject bicycle would seem to indicate 27" wheels and a 1977 model. Passed inspection. Carry on, soldier! Seriously, nice clean-up. There's only some minor chips and very light rust. Enjoy your new acquisition and thank-you for posting. 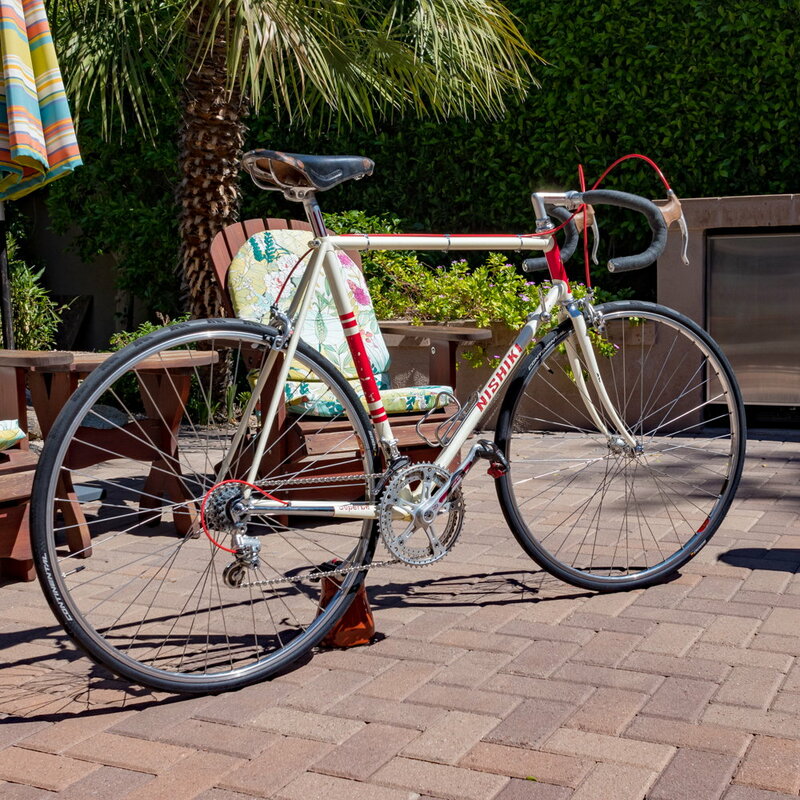 I do think it is a '77 but the wheels, Araya on Shimano hubs 5 speed, are 700. 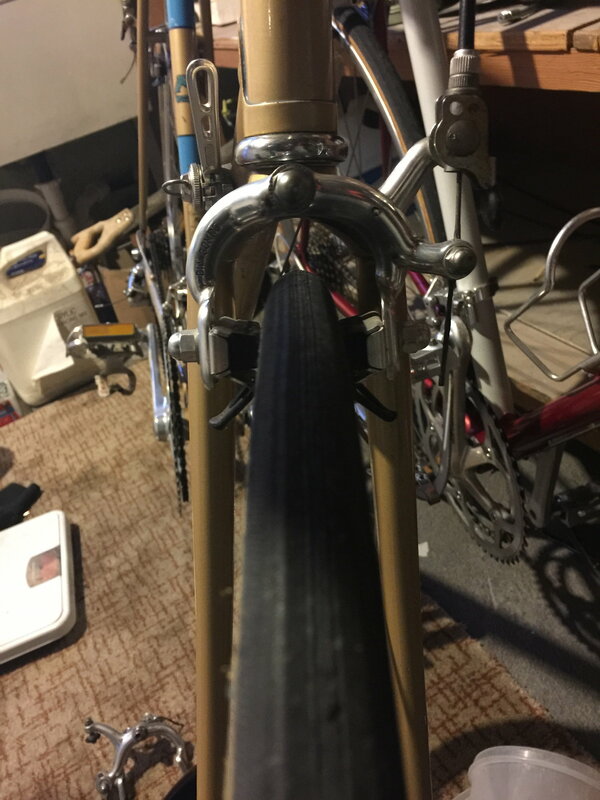 The rear rim appears to drilled to Shrader, the front is Presta. 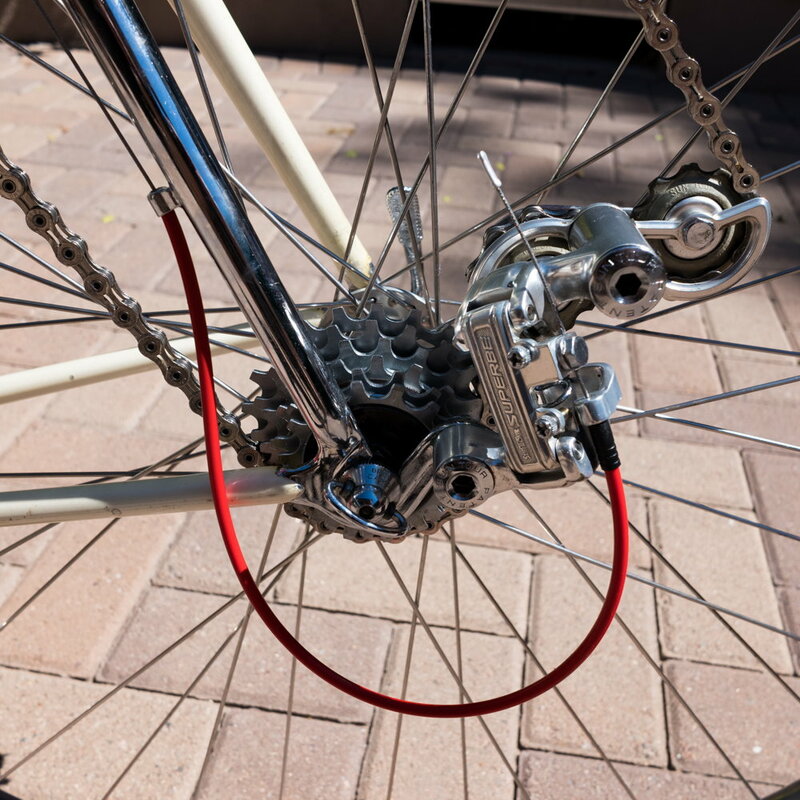 I've looked at the Diacomp G brakes, they do not appear to ever been repositioned for different wheels. 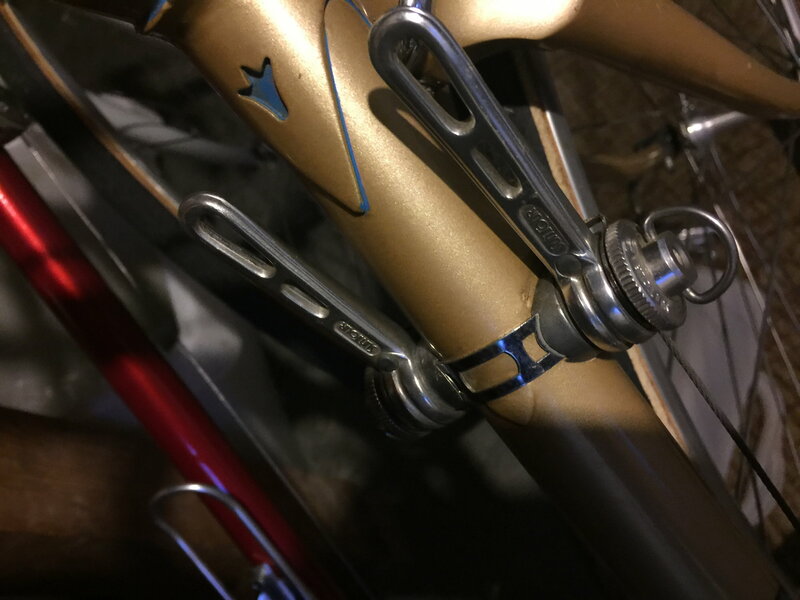 The brake hoods are supple the levers are Diacomp. The saddle made me think it was '80s is beat up, do you recall what saddle came with? With the rims being metric it makes me wonder if it is a '78, but I could not find a picture of a gold '78, the ones I found were black. 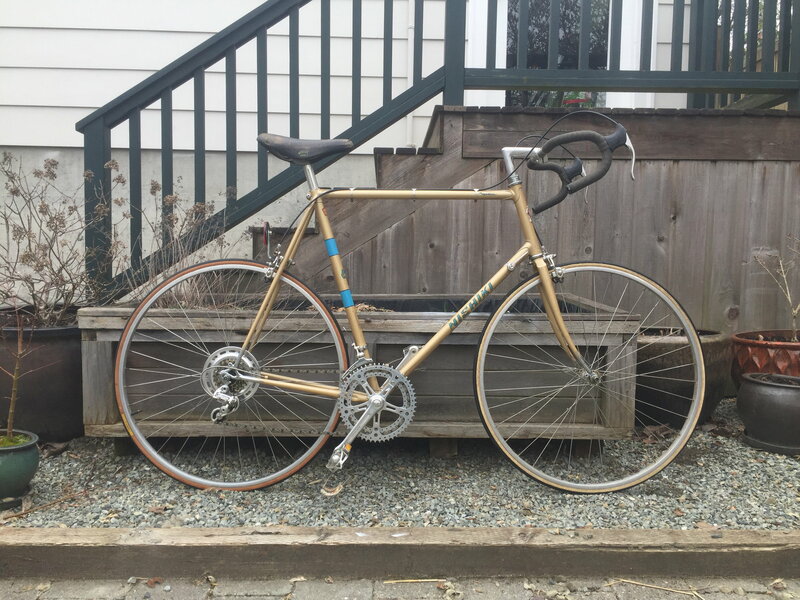 I did see a few gold lower level Nishiki pictures and found, what is advertised as a competition, a gold '77. That one had 27" Araya rims that the same style as my 700. 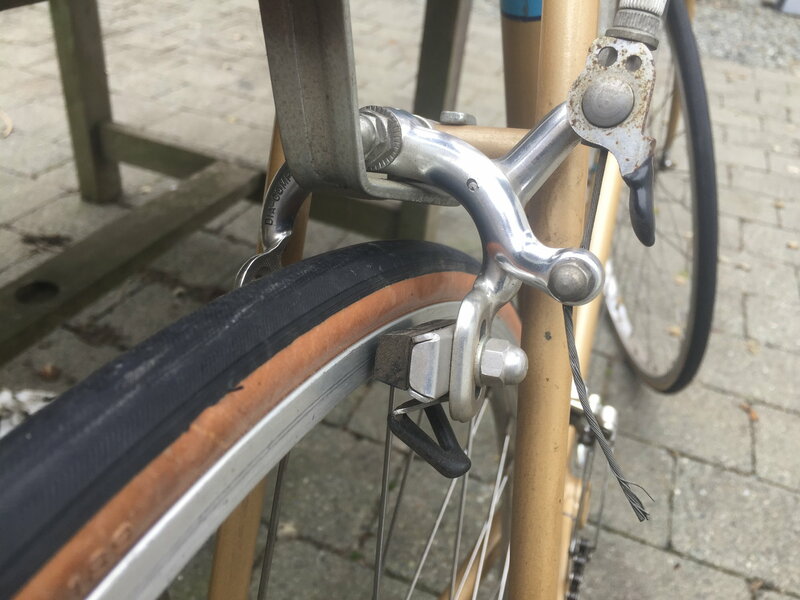 That bike had centerpull brakes. And by chance do you know what the msrp was? Champagne was a colour option in 1978, along with red and black. Spec wheels in 1978 used Sanshin hubs laced to Araya 20A rims. I couldn't identify the hubs from your pictures but thought the transition to the sidewall looked too square to be a 20A. It reminded me more of a U-section, single wall, 16A. Spec saddle in 1978 was Elina, padded suede. Sorry, in this case I don't have the MSRP but my educated guess would be $300-$350 US, depending on the year. I can tell you that it was the 2nd from the top bicycle in 1978. I qualify that by saying bicycle, as there was also a higher grade frameset that was catalogued. I'm still leaning towards a 1977 model based on the full "Competition" model name. The 1978 literature clearly used the abbreviated "Comp". I can't recall if I've seen an actual "Comp" but I know we've had a few of the slightly later "Comp II". If you want to increase your confidence one way or the other, you can always purse the component date code route. If you do, please post your findings. TIA. Last edited by T-Mar; 03-27-19 at 10:51 AM. Hello T-Mar, I’m littel confused it sounds like you answered my question but I wasn't able to upload it. Pictures do upload prior to 10 posts but they do not display with the text. Instead, they get routed to a separate repository where members can view them, if they're willing to take the time and do a bit of searching. For instance, here's one of your pictures. So, I don't have a crystal ball and wasn't making things up. I just knew where to look and was willing to invest a little more time to find them. Last edited by T-Mar; 03-28-19 at 06:43 AM. Iam very convinced by the quick response and that you took the time to search. Your answer is perfect and answers exactly my question, thank you very much. The size of the seat post is 26.4 mm.